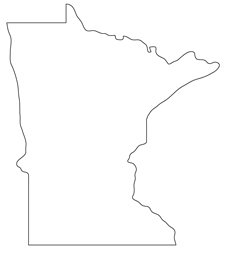 The estimated population of Minnesota is over 5,197,600 with a workforce of approximately 2,930,600. Minnesota is the 21st largest state in terms of population and, as is the case nationwide, it’s agencies are in need of more and more Minnesota computer forensics professionals. While farming, paper pulp, and mining are three of Minnesota’s major industries, computer forensics is a rapidly growing field in this state as well. Minnesota is a very progressive state, especially in the Twin Cities. Minneapolis and St. Paul are not only great metropolitan areas in which to live, but agencies in these cities are clamouring for computer forensics experts. In all reality, agencies across the state are in the same boat. In Minnesota, you have both campus and online options available to you in order to earn a computer forensics degree. Online colleges and universities that offer computer forensics programs are becoming more prevalent. However, in many states, including Minnesota, there is a limited selection for campus-based universities offering forensic degree or certificate programs. There is one option for campus-based curriculum in this state and it is Fond du Lac Tribal and Community College located in Cloquet, Minnesota. This school offers an Associate’s in E-Crime Investigation along with a Computer Forensics Certificate. The vast majority of federal and state agencies have great computer forensics training programs. They have acknowledged the fact that colleges and universities are still catching up with the demand, so they have taken the initiative to prepare individuals for the computer forensics job tasks they will be facing. The good news is that, as you have seen, there are still a number of computer forensics degree options available to you to get you career pursuit started. When it comes to standard operating procedure in computer forensics, every state has its own laws and procedures. Currently, Minnesota is operating with regards to the Federal Rules of Civil Procedure Amendments. Minnesota adopted the Federal Rules of Civil Procedure amendments without the mandatory meet and confer provision*. In Minnesota, individuals in the computer forensics field make far greater money than the average pay across all professions in the state. According to the United States Department of Labor, Minnesota has an average state salary of $41,510 across all professions*. Computer forensics professions make around twenty-five percent more than that figure at $64,000 a year**. Of course, as with any profession, the pay for computer forensics varies by the specific city you practice in. For instance, in Minneapolis the computer forensic salary is drastically higher than in Duluth, mainly due to the size of the two cities**.